Hennes navn er Bond. James Bond. Og denne lille gruppen tur tar deg gjennom de travle gatene i Roma som James Bond gjorde i filmen Specter . Hopp inn i den elegante, svarte minivanen, og fart deg gjennom trafikken, gjør ditt beste 007. Gå der Bond gikk i filmen og avslutt turen med en ekte martini - rystet og ikke rørt, selvfølgelig - før du returnerer til deg, ikke -sekret-britisk agent liv igjen. We had a great time on this trip. I had booked it for our family 2 adults and 2 children aged 10 and 9, primarily for our James Bond mad children but my husband and I both really enjoyed it too. 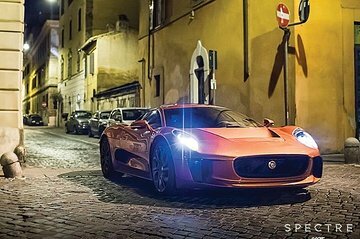 Not only were we taken to the settings for many of the scenes from Spectre in Rome but also to other landmarks as we drove around in the city at sunset and at night. This was particularly useful as it was our first day in Rome and with subsequent sightseeing on following days. The tour itself was very well organised: we were shown clips from the film at each relevant scene and the minivan was there at each stage when we had finished, very seamless. The night was rounded off with a Martini, just what we needed. Many thanks to our lovely guide for a fun night.